Acute appendicitis is the most common cause for emergent abdominal surgery in pediatric patients. Although most children with acute appendicitis typically present with clinical signs and symptoms that suggest acute appendicitis, approximately one-third of children with acute appendicitis have uncertain and non-specific clinical signs and symptoms. In these pediatric patients, further evaluation with imaging studies is often necessary for proper patient management. 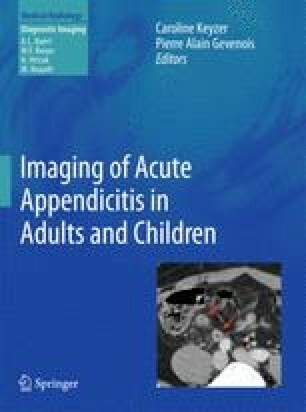 The overarching goal of this chapter is to review the plain radiographic evaluation of acute appendicitis in children including current imaging technique, characteristic primary and secondary imaging findings, and interpretation of plain radiographs of acute appendicitis in pediatric population.